Even before the school bell rings in the first period, Sven, Max, and Paul steal Finn’s breakfast: organic bread garnished with blossoms of Indian cress. Chicken feed! That’s just what the three were waiting for to ridicule him. They start to cackle and roar and then they throw Finn’s breakfast onto the floor and trample it with their feet. 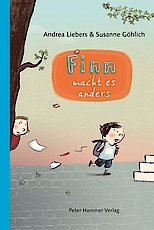 Finn fears the next attack during recess when something unexpected happens: The Police show up at school searching for three students who did something really, really bad. When Sven, Max, and Paul come under serious suspicion, Finn gets his moment in the limelight: He can provide them with an airtight alibi! Andrea Lieber tells a gripping school story about intimidation and fear and an unusual act of liberation. Susanne Göhlich’s illustrations are vivid, rich in detail, and capture the special emotional state of the characters.